A federal judge on Thursday warned jurors at Sen. Ted Stevens' corruption trial to be courteous and respectful of each other after the panel's leader described "violent outbursts" that threatened to derail final deliberations. Before quitting for the day, 11 members of the 12-person jury asked U.S. District Judge Emmet Sullivan to immediately dismiss a female juror, describing her as rude, disrespectful and unreasonable. "She has had violent outbursts with other jurors, and that's not helping anyone," said Sullivan, reading the note publicly to Stevens, R-Alaska, his lawyers and Justice Department prosecutors in an afternoon session. Sullivan, who rejected suggestions to question the jury foreman and the accused juror, instead brought the panel of eight women and four men back into the courtroom for what he called a "pep talk." "You should encourage civility and mutual respect among yourselves," Sullivan told jurors, with some nodding and others smiling before heading back to continue deliberations. After the jury left, Sullivan pronounced his solution a temporary success. "It's significant that no one appeared to be agitated," said the judge, who then advised lawyers to "stay tuned" before leaving the bench. The jury ended its second day of deliberations without reaching a verdict. Jurors sent the judge a final evening note saying they had "exhausted" themselves and would continue deliberations Friday. The middle-aged juror in question was identified in the note by her jury number. During jury selection this person said she worked in the National Guard's property office and had a background in accounting. Hours after receiving the case Wednesday, jurors had told the judge that things had become stressful and asked to go home. The midday note said "jurors are getting off course." Stevens, the longest-serving Senate Republican, is charged with lying for years on Senate financial disclosure documents to conceal $250,000 in home renovations and other gifts from his friend, millionaire oil contractor Bill Allen. Stevens has maintained his innocence amid a tight re-election campaign. Democrats have spent heavily in an effort to seize control of a seat Stevens has held for 40 years. 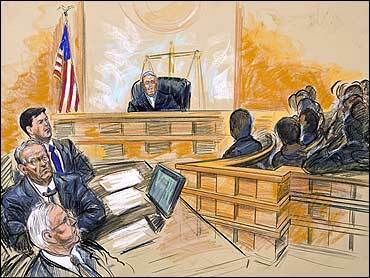 Tension in the jury room normally is viewed as good for a defendant. It increases the likelihood that jurors won't reach the unanimous decision needed for a verdict. Without a unanimous vote, a trial ends in a mistrial and prosecutors must decide whether to start over. Sullivan said he was unclear whether the note meant there was physical violence in the jury room, and considered questioning the jury foreman. But judges are loath to do anything that might steer jurors to one outcome. Stevens' attorneys urged caution. "It cannot be the law that 11 people on a jury can ask that one person be removed," attorney Robert Cary said. "If they're being violent they can," Sullivan responded.